Hello my stamping friend! Welcome back to this week’s card sketch challenge, with the Paper Craft Crew! Remember – the sketch is a ‘jumping off’ point for your project. You can flip the sketch upside down or sideways, or change the shape of the focal point. Just be sure that the basic sketch is recognizable in your interpretation. I knew what I wanted to use for my card, so I flipped the sketch sideways, to make it fit my idea. Here’s what I came up with. I love this fun new stamp set called Half Full, found in the Holiday catalogue. In case you didn’t notice, this set was inspired by Million Sales achiever Linda Bauwin, a demonstrator in the U.S. who reached her million $$ lifetime sales this year! That’s right – a million dollars in sales! What an amazing achievement. Whenever a demonstrator reaches this amazing milestone, they get to collaborate with a designer at Stampin’ Up! to create their ‘own’ stamp set design. I’m a white wine lover myself, but I love the Fresh Fig colour, so I used that as my main colour, pairing it with Lemon Lime Twist. My card base is Fresh Fig cardstock, layered with a panel of Lemon Lime Twist cardstock. On top of that is a panel of Whisper White cardstock, stamped with the splatter image from the Timeless Textures stamp set, in Fresh Fig ink. To create the focal point, I inked up the large sentiment first in Versamark ink, the immediately in Lemon Lime Twist ink, and stamped onto a piece of Whisper White. I immediately covered it with Clear Embossing Powder, and set it using the Heat Tool. I then coloured in the leaves and grapes using a Blender Pen and ink from the Pear Pizzazz and Fresh Fig ink pads. There is no coordinating punch or die with this set, so I snipped the sentiment shape out with my Paper Snips. Next, I took a smaller panel of Fresh Fig cardstock, and stamped the glasses image repeatedly across it in Versamark ink. 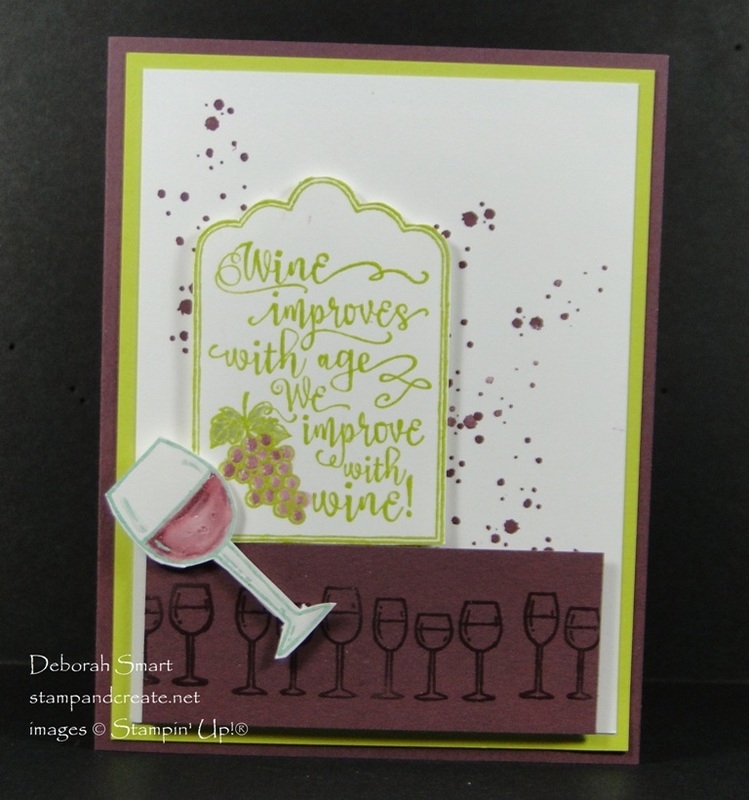 I covered the stamping in Clear Embossing Powder again, and heat set it, for a tone-on-tone look. 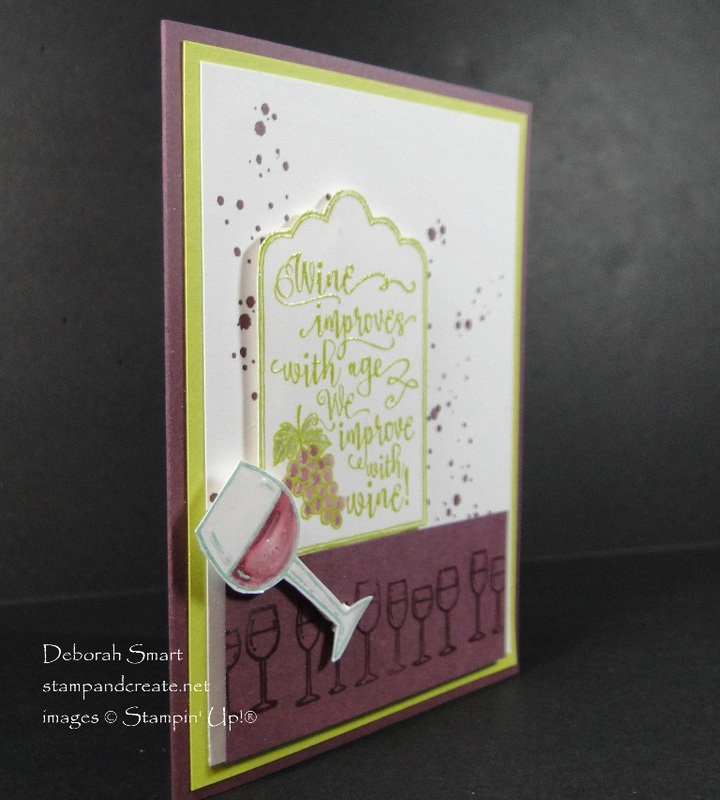 The wine glass was again stamped in Versamark ink then Pool Party ink, stamped and heat set with the Clear Embossing Powder and Heat Tool. 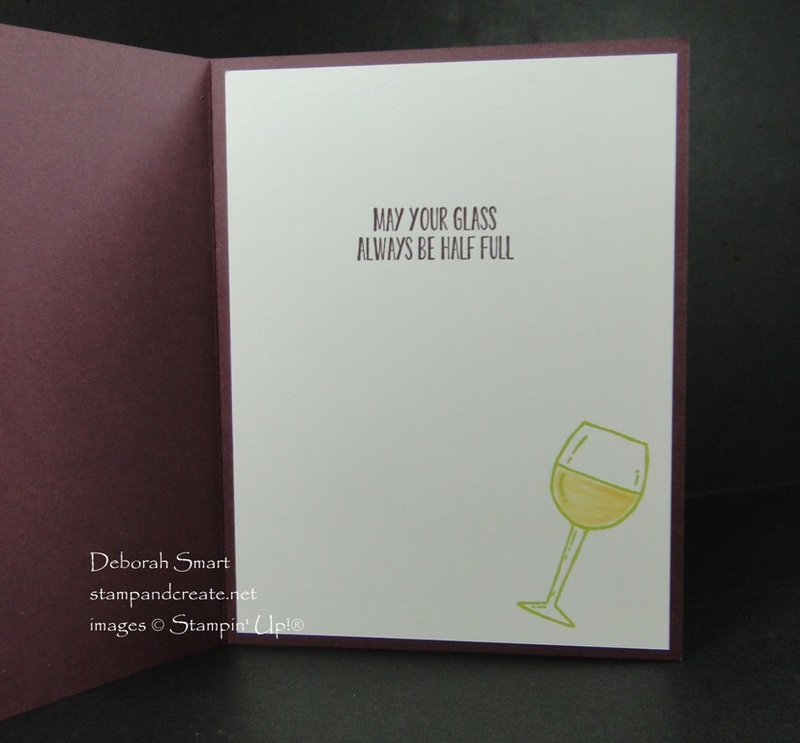 I then used the Fresh Fig ink pad and a Blender Pen to colour in the ‘wine’ in the glass. To add a bit of gloss, I took the Fine Tip Glue Pen, and layered glue over the ‘wine’, the stem of the glass and the highlights on the glass, and set it aside to dry. In the picture above, you can see the shine from the Clear Embossing Powder, and a bit of the gloss from the Fine Tip Glue. Once all the pieces were ready and the glue had dried, each piece is layered onto the Whisper White cardstock panel, using Stampin’ Dimensionals. I like how the embossing, glue and layers create so much dimension on the card. If you don’t already have a demonstrator, you can order your supplies from my online store. Click on the images below to go directly to my store for those products, or on my signature, to go browsing. This is a perfect example of a stamp set you own that I do not. If you didn’t see my reply to your comment I said we should love closer so we can share stamp sets! Adorable card! That would be awesome if we lived closer, Susan! 🙂 Creating with friends is always more fun!